As someone who found her dress within an hour of the first shop, I felt inclined to share my dress story. As the blogger, I’m finding it very hard not to talk about my experiences in organising my wedding. When you first walk into a store, sometimes it can be daunting; you don’t know where to begin or everything might look the same to you. It can even stop you from taking your time to try some dresses on. Some people find it hard to visualise themselves in a dress and thus get impatient in browsing the store. When I first walked in with my mum and siblings, I didn’t know where to begin and every dress looked the same to me. My mum picked up a couple of gowns and told me that they were the styles I had been looking at online. When I tried on the first dress, I thought ‘my gosh, I feel amazing in this’. 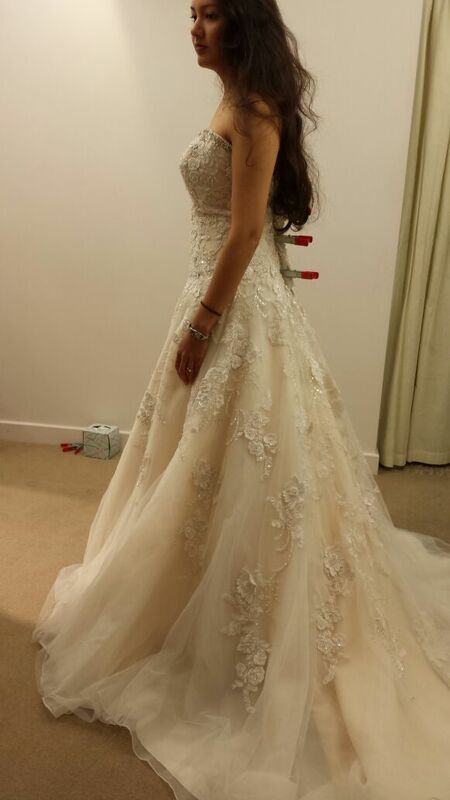 I then tried on the second, which was the one that my family preferred. The first dress, however, had stolen my heart – maybe because it was the first bridal gown I had tried on – but nevertheless, it made me feel fabulous and that was the one I went for. It took under an hour to look, try on and purchase my gown and it was so hard to keep it a secret from my family and friends. Some of you might think that maybe I did it too quickly and I should have been patient and looked at other dresses. My husband and I organised our wedding in two months, and so we didn’t have the luxury of taking our time. I would advise others to take their time in choosing a dress, however, if you find one as quickly as I did, and makes you feel special, then it’s a bonus. I can imagine that it can get frustrating going from one store to another and finding it hard to make a decision, that’s why at Just A Day we have a huge selection available in many sizes, ready to be tried on. I have had no regrets and I felt a million dollars on my wedding day. Nearly two years on, I still love talking about it.